PLCs can range from small modular devices with tens of inputs and outputs (I/O), in a housing integral with the processor, to large rack-mounted modular devices with a count of thousands of I/O, and which are often networked to other PLC and SCADA systems. When digital computers became available, being general-purpose programmable devices, they were soon applied to control sequential and combinational logic in industrial processes. However, these early computers required specialist programmers and stringent operating environmental control for temperature, cleanliness, and power quality. To meet these challenges the PLC was developed with several key attributes. It would tolerate the shop-floor environment, it would support discrete (bit-form) input and output in an easily extensible manner, it would not require years of training to use, and it would permit its operation to be monitored. Since many industrial processes have timescales easily addressed by millisecond response times, modern (fast, small, reliable) electronics greatly facilitate building reliable controllers, and performance could be traded off for reliability. PLCs come with many features varying from tiny modular devices with small amounts of I/O, contained in a processor rack, to bigger rack-mounted devices with a tally of much more I/O, and which are frequently connected to other SCADA applications and PLCs. PLC can be manufactured in many different ways with Digital and Analog I/O, wide variety of ranges in temperature range options and durable to work in critical hazardous conditions. Projects to control machine have programs activity are ordinarily held in battery-upheld up or secure memory. It was from the car business in the USA that the PLC was conceived. Prior to the PLC, control, sequencing, and security interlock rationale for assembling vehicles which was done with circle controllers, cam clocks and drum sequencers. Since these could number in the hundreds or even thousands, the procedure for refreshing such offices for the yearly model change-over was very tedious and costly, as circuit repairmen expected to exclusively rewire the relays to change their operational features. At the point when digital PCs wound up accessible, being universally useful programmable devices, they were before long connected to control consecutive and combinatorial rationale in mechanical procedures. These early PCs required skilled software engineers and strict working conditions for temperature and power quality. To address these difficulties the PLC was created with a few key qualities. It would endure the shop-floor condition, it would bolster discrete (piece structure) info and yield in an effectively extensible way, it would not require long periods of preparing to utilize, and it would allow its task to be observed. Since numerous mechanical procedures have timescales effectively tended to by millisecond reaction times, present day (quick, little, reliable) hardware extraordinarily encourage building dependable controllers, and execution could be exchanged off for reliability. A PLC-5 processor talks over the 1771 backplane to 1771 I/O modules in the chassis in which the processor is found. The different types of PLC-5 model processors have different on-board ports for talking with different processors, PCs, and remotely found I/O. Likewise, separate modules are accessible to give extra ports for talking. 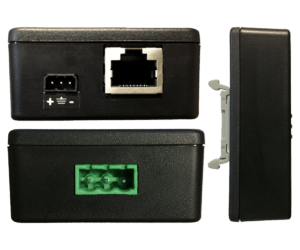 Each PLC-5 processor includes RS-232/422/485 port. Each PLC-5 processor likewise has at least one on-board ports that can be setup for either Data Highway Plus (DH+) or Universal Remote I/O. As a Universal Remote I/O port, it can be setup as either an I/O scanner port or an I/O port. 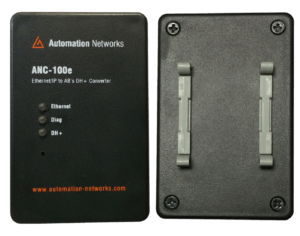 Certain models of PLC-5 processors have on-board ports for Ethernet, ControlNet, or Extended Local I/O. As well as on-board ports accessible with PLC-5 processors, including another port for a PLC-5 processor is as straightforward as including a optional module. 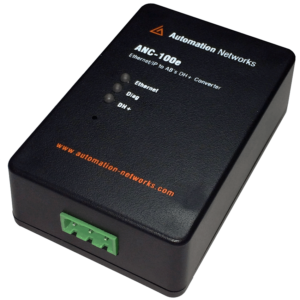 I/O adapter modules for 1771 I/O are accessible for ControlNet, Universal Remote I/O, and Extended Local I/O. An I/O adapter module in a chassis with I/O modules interfaces the I/O modules with the I/O link for correspondence with a scanner port of a processor at another area. 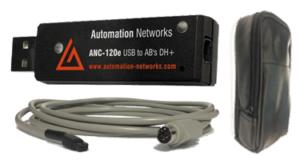 ANC DH+ Communications Products: Both the ANC-100e, Ethernet to DH+ Converter and the ANC-120e, USB to DH+ PLC Programming cable are ideal solutions for interfacing your RSLINX LOGIX PLC Programming Software to PLC-5s for optimal programming communications.